A few months ago, I was toying with the idea of returning to blogging after taking a hiatus. One of the things that helped push be back to being an active blogger is the fact that the International Food Blogger's Conference (IFBC) will be in Sacramento September 29 - October 1. Sacramento has gained fame for being America's Farm-to-Fork capital, so it makes it a natural fit to host the IFBC. Since I live in Sacramento, was a no-brainer for me to sign up. I am registered and ready to participate! I have agreed to publish at least three blog posts about the conference for a registration discount. All opinions are my own (which is one of my favorite things about blogging!). This is the first of three posts. Networking with other bloggers - very important for an introvert like me! Learning how to make money from my blog. Embracing social media, which is somewhat difficult for this reserved Gen Xer. Seeking opportunities that may be available for food bloggers. It's not too late to register if you are interested. 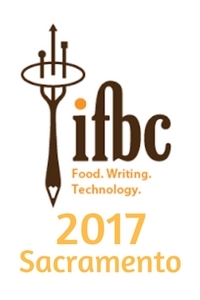 Simply visit the IFBC's website for complete details. I'm looking forward to meeting some new people in Sacramento! I'm also not good with social media. Hope you enjoy it. Nicely written blog and nice information shared. Looking for Event Planner tool then EventsAIR is a robust meeting planner platform for customized event management process. Great post on the food. Looking for the food suppliers and List Of Food Manufacturers In Trinidad And Tobago then, I recommend you to contact dFindar Company.